Many people have a misconception that if they can thoroughly brush their teeth, they can avoid having dental caries. In fact, in order to effectively prevent dental caries, we have to start with a good dietary habit. What kinds of food will lead to Dental Caries? All food that contains sugar can be metabolised by the bacteria in the plaque located on the tooth surfaces to produce acid. The acid will attack enamel of the teeth which will lead to dental caries. Most of the food and drinks available in the market contain sugar which will increase the risk of getting caries. As soon as we eat or drink, the bacteria in the plaque on tooth surfaces will metabolise the sugar and produce acid. 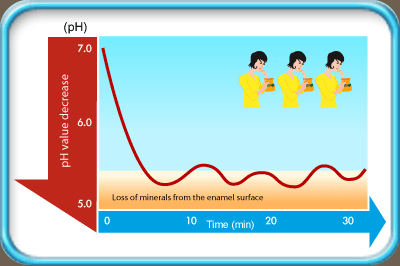 The acid will then lead to loss of minerals from the tooth surfaces. 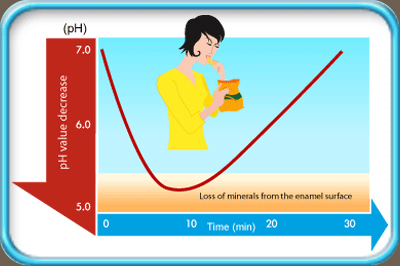 Chances of getting dental caries will be reduced by allowing sufficient time in between meals for the saliva to neutralise the acid and redeposit minerals onto the tooth surfaces. If one snacks frequently, there will be continuous production of acid by plaque bacteria and insufficient time for the saliva to neutralize the acid. This will result in persistent acidic environment which favours the development of dental caries. Therefore, even a small piece of biscuit or a sip of beverage is considered one snack, which will bring one more chance of getting dental caries.